Think back to college days when money was nonexistent and healthy food was something only found in textbooks. We raided every cafeteria and fast food joint in town for napkins, plastic silverware and assorted condiment packages, knowing which ones had the best of each. Funny how we always had plenty of plastic red cups though. We are now a day away from our actual move. Everything is in boxes including all silverware and my cloth napkins. I’m tempted to relive those college days of hoarding silverware packs and napkins from restaurants; my strive to be green is tested but wins out as I rip the tape off the box marked kitchen #15 to retrieve a couple of forks and knives. And aside from Chinese mustard there isn’t a food in a condiment package I eat. But that leaves me to question what can I make that doesn’t involve me unpacking a lot of pans and utensils. I want to have something that is pre-made that I can just grab and go. Something fresh and healthy but hearty to keep us strong for the move but isn’t nasty takeout food. 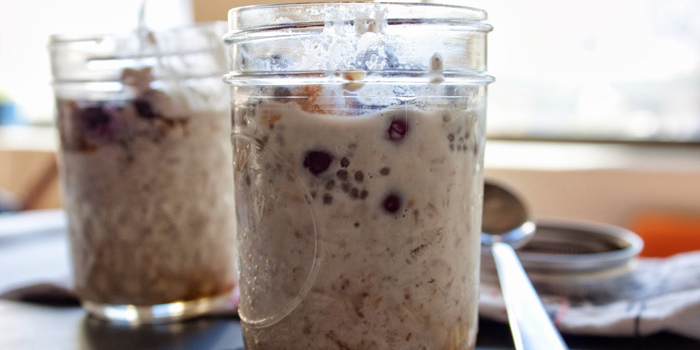 Overnight refrigerator oatmeal isn’t an original Fat and Happy creation, but I really do like the variations and flavors I’ve come up with. It lasts in the fridge for a few days and doesn’t require perishable food. Just some oatmeal, a few nuts and some fixings like frozen berries and chia seeds. Drop it all in a jar, screw on the lid and let it do its thing. Grab one out of the fridge for an easy ready made meal or snack. 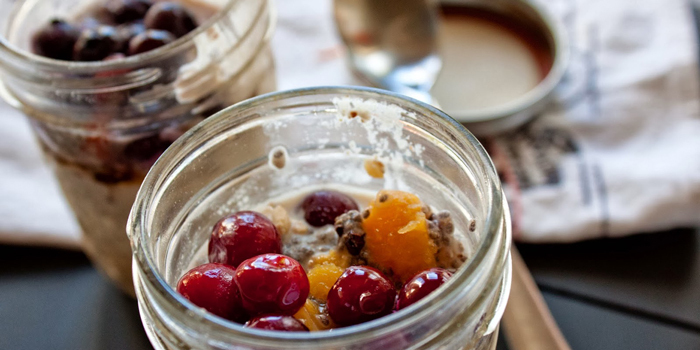 Both the Blue and Goji Berry Vanilla Oatmeal and Cranberry Pumpkin Oatmeal turned out stunning for me. You could make hundreds of versions by varying the ingredients of fruit, nuts, seeds, milk or coconut flakes; they all offer endless possibilities. This is an easy recipe to add superfoods like goji berries, chia seeds, maca powder, cocoa and more. Use frozen fruit because it offers extra juice as it defrosts. These are great recipes whether you are moving or not. Imaging throwing one in your bag for after a workout or as breakfast on the go; you can eat them chilled or warm them slightly. They are pretty cheap on the pocketbook, and if you’re a clean eater you may not even need a napkin. You will, however, need a spoon; but you know where to get that. 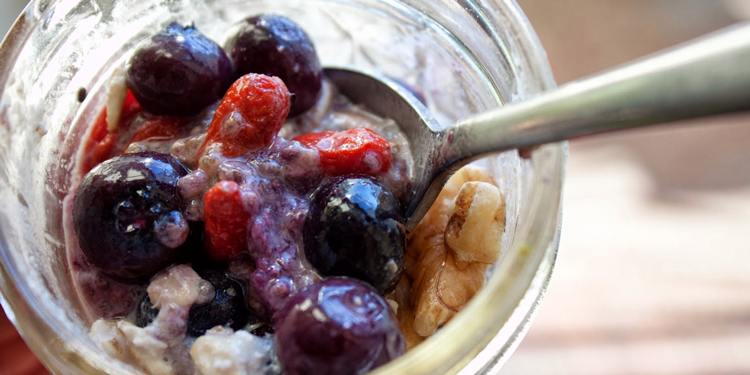 Use these recipes as guides, adding more oatmeal, berries or liquid to your preference. I used small glass jars rather than a full quart size, but play with what is right for you. For the liquid, I put a handful of almonds in the blender with a cup of water and blended to make the milk but use what you have. 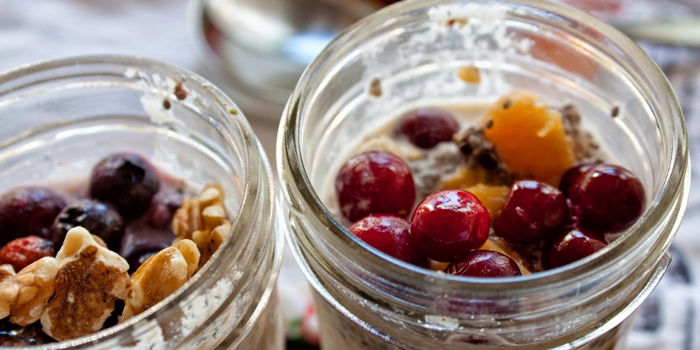 Add all the ingredients in a jar, place in the refrigerator overnight and up to 3 days. Fat and Happy Food Blog Tips and Techniques: I like original oatmeal in this for extra chewiness rather than quick cooking. This also work well using leftover brown rice too!